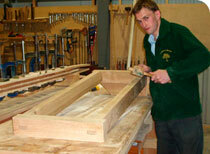 In 2007 Deep in Wood was established and restored a large capability sawmill. This decision was made due to the increase in demand for locally sourced timber. Initially only providing a joinery service Deep In Wood soon developed to what it is today, providing a range of services from design and build to providing the wholesaler and individual alike. Deep in Wood has also opened a showroom which houses its own range of furniture and a self help timber store. The team at Deep in Wood are very knowledgeable in what they do and are always happy to give you advice on any project you encounter.